“Figure 1. Counter-rotation of the eyes during swimming movements is now explained by a simple wiring diagram involving the spinal cord. “When Xenopus tadpoles swim, the body undulates back and forth, causing the head to rotate to the left and right. These movements are associated with eye rotations in the opposite direction, which maintains a relatively fixed field of view in front of the animal. “The out-going (‘efferent’) motor command reaches the spinal cord and activates the spinal central pattern generator (CPG), initiating a body bend via axial muscles (AM) in the tail that rotates the head to the right. 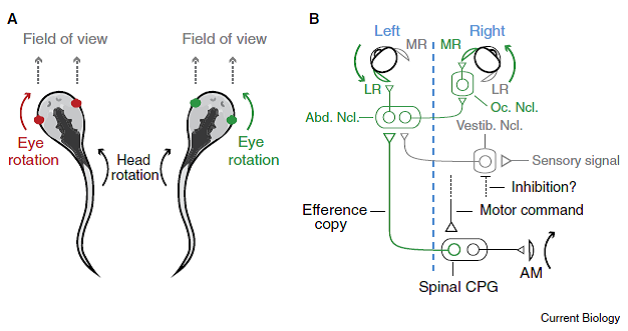 “Spinal interneurons relay [copies of ]this signal (efference copy) across the body back to the ocular motor pools, which generate bilateral eye rotation to the left. “interneurons that activate motoneurons in the ocular nucleus (Oc. Ncl. ), which in turn drive medial rectus (MR) muscle activation. “Sensory signals arriving via the vestibular nucleus (Vestib. Ncl.) target the same nuclei, but are presumably inhibited by an as yet unknown pathway. Professor: From this figure and its legend modified from Figure 5 D in Lambert et al. (2012), the spinal interneurons are the carrier of an efference copies that bypass the vestibular nucleus to drive the ocular muscles. But when the re-afferent inner-ear signals for rotation do arrive at the vestibular nucleus, the output of the reflex is somehow suppressed by active medial and lateral rectus ocular muscles. Bagnall & McLean (2012) also references studies of Roy & Cullen (2004) that demonstrated movement “suppression occurs only for expected ‘proprioceptive’ sensory input from neck muscles matches expected neck motion”. Student: That is a fascinating oculomotor over-ride system. Let’s get back to locomotion and limb muscle feedback suppression circuitry. Professor: Limb muscle feedback comparison starts out with spinal interneurons, too. Student: How is the feedback from the motor system separate what is happening in muscle activity from what external forces changes locomotion? Like when you step in a small hole in the ground? “Fig. 1 Putative subpopulations of feline DSCT and VSCT cells in the lumbar region. B. Illustration of the cerebellar projection areas of spinocerebellar tract neurons. The unfolded and flattened cerebellar surface as in (Grant, 1962) is labelled with Roman numerals to indicate regions according to Larsell´s defined regions (Larsell, 1953). Student: Egad! We are that complicated. Wow! “Emerging anatomical and electrophysiological information on the putative subpopulations of DSCT and VSCT neurons suggest differentiated functions for some of the subpopulations. “Multiple lines of evidence support the notion that sensory input is not the only source driving DSCT neurons and overall, there is a greater similarity between DSCT and VSCT activity than previously acknowledged. “Indeed the majority of DSCT cells can be driven by the spinal CPGs for locomotion and scratch without phasic sensory input. Student: I get it. Subpopulations of the spinocerebellar tracts can tell about that small hole in the ground and others that are efference copies can predict our expected walking muscle actions. Are there pathways for efference copy signal from the cerebral cortex that bypass the spinal cord? Professor: I am going to discuss cortico-striatal pathways in a later post. But now what can look at the disynaptic cortico-ponto-cerebellar pathway. Sauvage et al. (2013) very recently have studied foot movements, both real and imagined. “Overt movement execution and motor imagery shared a common network including the premotor, parietal, and cingulate cortices, the striatum, and the cerebellum. “Motor imagery recruited specifically the prefrontal cortex, whereas motor execution recruited specifically the sensorimotor cortex. “We also found that slow movements specifically recruited frontopolar and right dorsomedian prefrontal areas bilaterally, during both execution and mental imagery, whereas fast movements strongly activated the sensorimotor cerebral cortex. “Finally, we noted that anterior vermis, lobules VI/VII and VIII of the cerebellum were specifically activated during fast movements, both in imagination and execution. “First, … a portion of the cerebellar vermis is a major target of projections from the cerebral cortex. 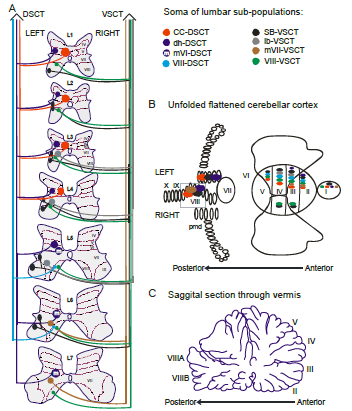 “Second, projections to lobules VB–VIIIB of the vermis originate mainly from motor areas in the frontal lobe and especially from [primary motor center], [supplementary motor area], and [dorsal and ventral cingulate motor areas]. “Third, these projections arise from regions of cerebral cortex that represent distal as well as proximal body parts. “FIGURE 3 The cerebello-thalamo-cerebro-cortical circuits(CTCCs). “The figure represents schematically the bidirectional connectivity between the cerebellum and the telencephalon, in particular with the [cerebral] cortex. “Telencephalic projections from the cortex and basal ganglia (through the subthalamic nucleus, STN) and limbic areas are relayed to the cerebellum through the anterior pontine nuclei (APN). “The cerebellum in turn sends its output through the deep cerebellar nuclei (DCN), red nucleus (RN), and anterior thalamic nucleus (ATN) to various telencephalic areas including the motor cortex (MC), the prefrontal cortex (PFC), the parietal cortex (PC), and the temporal cortex (TC). Student: You have found than all the same pathways that Proske & Gandevia (2012) cited for his final Figure 16. “FIGURE 16. 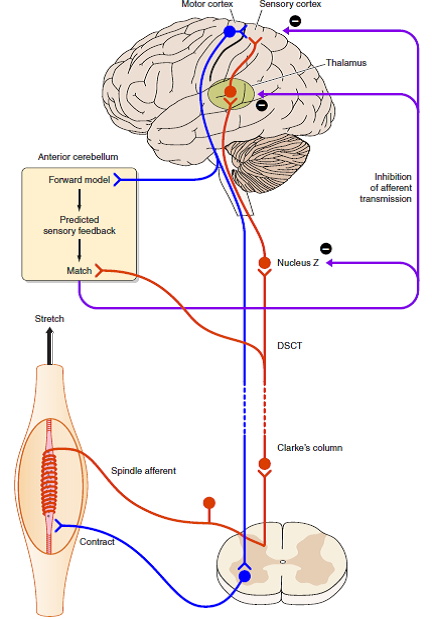 Possible mechanism (shown in diagrammatic form) for how the brain distinguishes between impulses coming from muscle spindles that are generated by muscle stretch (exafference) or by fusimotor activity (reafference). 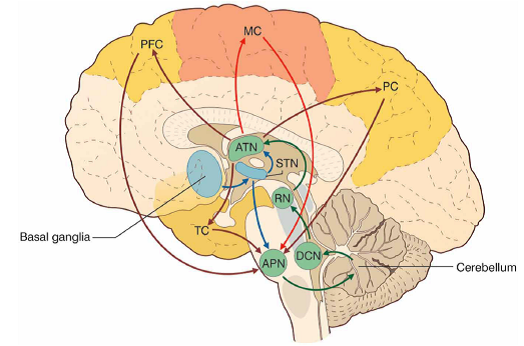 When the muscle is stretched, spindle impulses travel to sensory areas of the cerebral cortex via Clarke’s column, the dorsal spinocerebellar tract (DSCT), Nucleus Z, and the thalamus (shown in red). Collaterals of DSCT cells project to the anterior cerebellum. When a motor command is generated, it leads to coactivation of skeletomotor and fusimotor neurons (shown in blue). A copy of the motor command is sent to the anterior cerebellum where a comparison takes place between the expected spindle response based on that command and the actual signal provided by the DSCT collaterals. The outcome of the match is used to inhibit reafferent activity, preventing it from reaching the cerebral cortex. Professor: To my knowledge, they never report what the subject would report about the perception. In their studies, their instruction are to make a contraction relative to MVC or have the other arm contract to match the % MVC being experienced in the test arm. Student: Give me a break. No verbal report. Drats. I want to control my efforts, not have them be suppressed! Next: I want to look at the definitions of effort, exertion, and other “senses”, and then summarize how we can them as self-reports and even talk about them. Bagnall MW, McLean DL. Motor Control: Spinal Circuits Help Tadpoles See learly. Current Biology, 22 (2012) R796. doi:10.1016/j.cub.2012.07.007. Coffman KA, Dum RP, Strick PL. Cerebellar vermis is a target of projections from the motor areas in the cerebral cortex. Proc Natl Acad Sci U S A 2011;108:16068-16073. Cullen KE, Brooks JX, Jamali M, Carriot J, Massot C. Internal models of self-motion: computations that suppress vestibular reafference in early vestibular processing. Exp Brain Res. 2011 May;210(3-4):377-88. doi: 10.1007/s00221-011-2555-9. D’Angelo E, Casali S. Seeking a unified framework for cerebellar function and dysfunction: from circuit operations to cognition. Front Neural Circuits. 2012; 6: 116. 2013 January 10. doi: 10.3389/fncir.2012.00116. Lambert FM, Combes D, Simmers J, Straka H. (2012). Gaze stabilization by efference copy signaling without sensory feedback during vertebrate locomotion. Current Biology, 22 (2012) 1649-1658. doi:10.1016/j.cub.2012.07.019. Roy JE, Cullen KE (2004) Dissociating self-generated from passively applied head motion: neural mechanisms in the vestibular nuclei. J Neurosci 24:2102–2111. Sauvage C, Jissendi P, Seignan S, Manto M, Habas C. Brain areas involved in the control of speed during a motor sequence of the foot: Real movement versus mental imagery. J Neuroradiol. 2013 Feb 21. doi: 10.1016/j.neurad.2012.10.001.